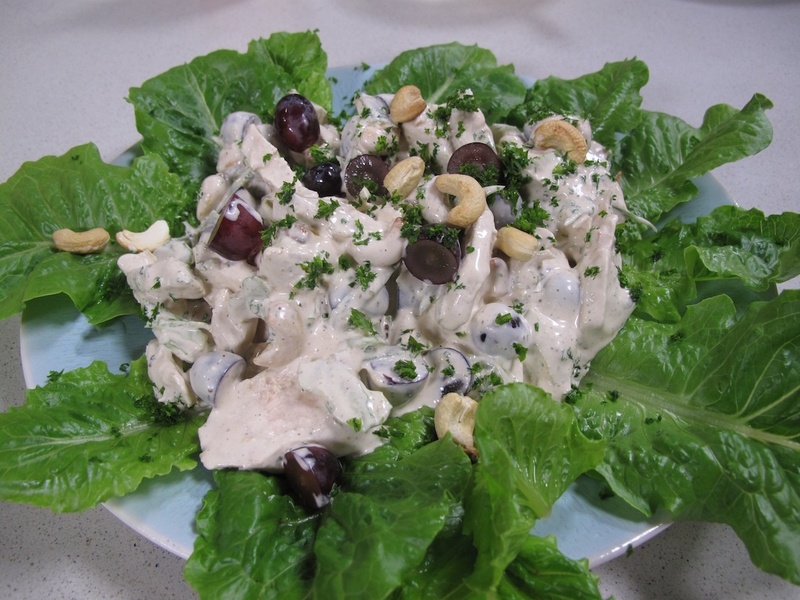 I prepared this dish on the expresso breakfast TV show on a day when the theme was “Winner winner Chicken Dinner”. Coronation Chicken was served at a private lunch at the Coronation of Queen Elizabeth 11 in 1953. The main course dish, also known as Chicken Elizabeth, was created by my cookery teacher in London, the wonderful Rosemary Hume. Here’s my take on the salad, as the original had no fruit in it. The grapes can be replaced by diced mango. The mayonnaise is for me a new way of making mayo of which I learnt from Colleen Grove, food blogger, and a fabulous cook and baker. Made with a stick blender and oh so easy. 1 Cos lettuce for serving it on. In a small saucepan, cook the onion gently until transparent. Add the curry powder and cook again for about 2 minutes. Add the tomato, wine, water and bay leaf. Bring to the boil and season with sea salt, black pepper and add the lemon. Cook for about 5 minutes in an open saucepan. Strain and cool. Use this essence and the apricot jam to flavour the mayonnaise and the cream. Cut the chicken off the bone, remove the skin and cut into strips and place in a bowl. Add the cashew nuts, grapes and celery and half the spring onions. Add as much curry sauce as you need. Dish on the Cos lettuce leaves and garnish with the remaining spring onions and parsley. Serve with any remaining sauce. The sauce is brilliant with chilled crayfish. This is a recipe the method for which has been around for quite a while. And I did not know about it! My friend Colly told me about it, so here is my version. I prefer for my mayo to use half olive oil and half of a lighter oil like sunflower, peanut or grapeseed. At the moment I am going through a phase where I like apple cider vinegar. Don’t use balsamic or red wine vinegar, it will colour the mayo. If you like you can add two fat clove of garlic to the egg yolks and you ill make a fabulous Aioli – the butter of Provence. A Stick Blender and the tall glass that comes with it. Gently move the blender through the oil to the bottom of the jar. Switch on the blender and immediately the egg will start emulsifying with the oil. Pull the blender slowly up through the oil and the mayonnaise will make itself on the way up. If the mayonnaise is too thick, you can add some hot water to thin it down. Makes slightly more than 375ml.